Peg Post, wife of former Massachusetts Conference MInister and President and also past President of the United Church of Christ, Avery Post, died of a stroke on Saturday, November 6, 2010. Her death was sudden and unexpected. Peg was 85 at the time of her death. She and Avery had been married for 65 years. Services are planned for Sunday, November 14th at 2:00 at the Congregational Church of Norwich in Norwich, Vermont. Margaret Rowland "Peg" Post, a long-time UCC educator and writer, died last weekend in her Hanover, N.H., retirement residence after suffering a severe stroke. Remembered as the one-time "first lady who was always there" for the UCC, Post, who was 85, was the wife of the Rev. 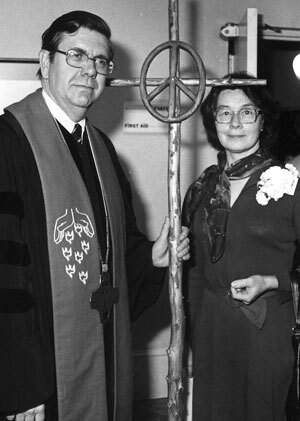 Avery D. Post, UCC president from 1977 to 1989. "She was very unassuming and gracious, yet very, very theologically perceptive," said the Rev. J. Martin Bailey, former editor of "United Church Herald" and "A.D. Magazine," predecessor publications to "United Church News." "She wasn't formally trained theologically, but she certainly absorbed it along the way," said Bailey. "She was a real lay theologian." Post put her theology to good use when writing one of the defining publications of the UCC. "History and Program," first published in 1982 by United Church Press, became known as "the little blue book" because of its first cover. The book, which covers the history, mission and structure of the United Church of Christ, is still in print today in its 5th revision, and is required reading in many polity courses taught at UCC-related seminaries. "History and Program" was just one of the many avenues Post pursued during her professional career in education and publishing. She worked at various times with the Wellesley Press, "Discovery Magazine" (Westminster Press), United Church News, and for the Central Committee of the World Council of Churches. The Posts, who had been married for 65 years, received a visit from Bailey and his wife, Betty, just last month. "It was a wonderful visit in which both Peg and Avery were in lively conversation," recalled Bailey. "Clearly, they both relied heavily upon one another for intellectual and emotional support. Both of them were eager for conversation about the United Church of Christ." "We are saddened by her death and will find ways to be supportive of Avery, not only just now, but in the weeks ahead," said Bailey. Peg Post is survived by husband Avery, four daughters and their children.